Alan Kirman found some interesting behavior in the foraging activities of ants. He starts his account by citing the results of an experiment by Deneuboug et al. (1987a) and Pasteels et al. (1987) where two identical food sources were offered to ants. They were replenished so that they remained identical. Ants, after a period of time, were found not to be split 50/50 as common sense would conclude, but rather 80/20. Kirman further noted that this 80/20 split would often reverse inexplicably. This phenomenon is mirrored in studies by Becker where only one of two similar restaurants on opposite sides of the street tend to attract long lines of customers. Apparently, this behavior is also mirrored by investors in a market. In part two of the series, the author introduces Melanie Mitchell’s book on complexity and especially what she writes on ants. I introduced the book in an earlier post. In part three, another interesting concept is introduced: herding. Herding was identified as a common behavior in markets, responsible for creating trends. Described as “History’s Hidden Engine”, socionomics posits that large trends in society and the market are driven by social mood. If the society at large is feeling positive, constructive behavior ensues, e.g. cooperation between governments, a rising stock market, expanding economy, box-shaped cars and brighter fashion tones. A negative mood will cause society to go to war, the stock market to decline, a recession/depression, rounder-shaped cars and darker fashion tones. Socionomics is counter-intuitive in that most people believe events cause social mood. The stock market goes up and investors feel happy. Socionomics believes that a society that feels happy, for whatever prior cause, will cause them to buy stocks. It is the mood that causes the event. This mood is generated and reinforced through the herding mechanism. I wonder how this herding behavior could be used in the work of developing markets for the poor in developing countries. I do recognize one type of herding in these contexts that I often don’t see as particularly helpful, but a very understandable behavior: all people in a region, market, village, etc. do the same thing, regardless whether it is particularly beneficial or profitable. In general, diversification would not only lead to higher profits by tapping new markets, but also to a higher degree of resilience by not depend on only one product. A negative instance of herding? Maybe the increasing interest of companies (and investors?) in social business can be seen as a positive type of herding that needs to be better exploited. 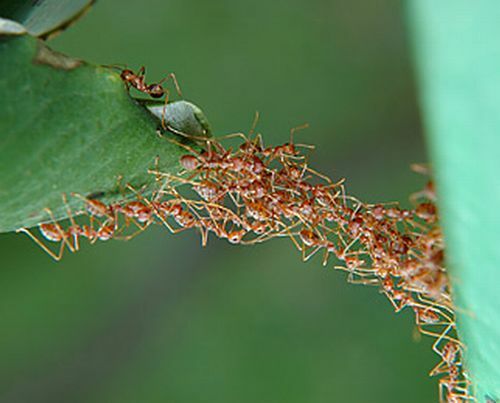 This entry was posted in reading and tagged ants, complex adaptive systems, complexity, herding, market on 13/01/2012 by Marcus.